Steaming is a gentle, fat-free cooking method that keeps the natural moisture in foods. This method uses the steam from a simmering liquid (usually water, seafood broth, or wine) to transfer heat to, and cook, a food. It is an excellent choice for preparing delicate seafood because there is a safe distance between the food and heat source, which helps to protect against drying. And steaming, unlike poaching or boiling, keeps flavorful juices and nutrients inside the seafood, rather than letting them escape into the surrounding cooking liquid. Many steaming vessels (bamboo steamers, pasta pots with a steaming insert, or pans specifically created for whole fish) are available in stores. Follow the manufacturer’s instructions for assembling the equipment and keeping the correct level of liquid in the vessel during cooking. 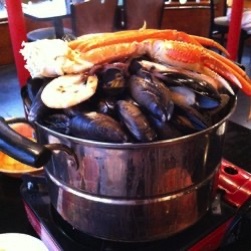 To make your own steamer, find a deep, wide pot and fill it about two inches full of cooking liquid. Placing a few small, heatproof dishes (ramekins or tea cups) in the bottom of the pot and set a wire rack on top. Tightly cover the pot with a lid and bring the liquid to a simmer. Place the food to be steamed either directly on the rack or on a small plate on top of the rack and cover again. This method works especially well for finfish. For shellfish, such as clams and mussels, try a simpler technique. Bring an inch or less of cooking liquid to a boil in a pan with a tightly fitting lid. Add the shellfish, cover again, and cook until most have opened. Discard any unopened shellfish. This technique may also be used for crabs and lobsters. Boost the flavor of steamed seafood by simmering ingredients such as lemon juice, white wine, onions, shallots, spices, or fresh herbs in the cooking liquid for a few minutes before steaming. These ingredients will scent the steam and add a subtle, but delicious, flavor directly into the seafood. Grilling gives a smoky flavor and crisped texture to finfish and shellfish. It works best for meatier, firmer-fleshed finfish cut in to steaks or fillets with skin. However, flakier finfish, skinless fillets, and smaller shellfish (that would otherwise slip through the grill grates) can be grilled using a grill basket. Grill baskets are non-stick wire cages—with a top, bottom, and long removable handle—that hold food firmly in place so that it can easily be flipped or removed from the grill. Prepare seafood for grilling by very lightly spraying both sides of it with olive oil or vegetable oil (away from direct flames). Spraying with oil rather than brushing or rubbing the oil in with your hands avoids contact with raw seafood to prevent cross-contamination with other foods you may be grilling. Once oiled, season seafood with salt and pepper. Or, marinate the seafood in your favorite combination of juice, herbs, spices and oils. Shake off excess marinade before grilling to avoid flare-ups. If using a gas grill, begin by preheating it for at least ten minutes on the highest setting with the lid closed. For charcoal grills, allow the fire to burn down so that you can comfortably hold your hand above the coals for only two to three seconds. At the proper cooking temperature, the coals will glow softly and be covered with a thin layer of ash. Next, clean the grate by scraping it with a grill brush then wiping it with a wad of paper towels dipped in a light coating of oil (grasp the paper towels with tongs to avoid burning your fingers). 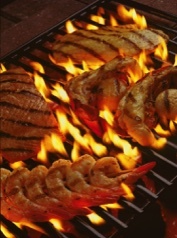 Both a very hot grill and a clean grill grate will help prevent seafood from sticking. Finfish, large shrimp, and scallops may be placed directly on the grill grates and cooked until opaque. Smaller varieties are easier to turn if placed on water-soaked wooden skewers or in a grill basket. Shellfish, including mussels, clams and oysters, may be placed directly on the grill and cooked until their shells open—about five minutes. Discard any that do not open after cooking. With a little more preparation, whole lobsters and crabs may be grilled, but grilling lobster tails and king crab legs is an easier (and just as delicious) option. As a general rule, seafood steaks and whole fish will take about 10 minutes to cook for each inch of thickness (measured in depth, not length). Thin fillets will take less time. If fillets have skin, place them skin side down and do not move the fish for at least two minutes to build up a crust that won’t stick. If grilling smaller fillets, make a few shallow slashes through the skin, which will keep the fillet from curling as the skin cooks and shrinks. Oven broiling adds a nutty, browned flavor and crisp texture to foods and is a quick and delicious way to cook many types of seafood. Fillets or steaks of finfish, large scallops or shrimp, and lobster tails are especially tasty when broiled. Begin by preheating the broiler and adjusting the broiler rack. 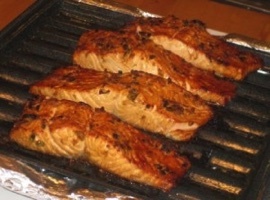 For thin fillets and small pieces of seafood, move the rack so that it is only about two inches from the heat source. This will allow the seafood to evenly brown before it overcooks, or becomes dry. For larger pieces of seafood, move the broiling rack four to six inches away from the heat source so that the inside cooks before the outside dries out or becomes tough. Prepare the seafood as you would for grilling. Ether lightly spray it with oil and season with salt and pepper or submerge it in a quick marinade and shake off any excess. Place it skin side down (if there is skin) on a lightly oiled, heat-proof broiling pan or cookie sheet and cook under the heating source using the guidelines above. Thin, delicate fillets will cook quickly and generally do not have to be turned over. Thicker fillets, steaks and shellfish will need to be turned about half way through cooking to be sure they are evenly cooked through. Estimate that it will take about eight to ten minutes per inch of fish thickness for the meat to reach an internal temperature of 140 degrees. If you find that the seafood is browning too quickly (before the inside cooks through), simply lower the broiling rack away from the heat source. Broiled seafood will continue cook and its internal temperature will continue to rise a few degrees (an average of ten) once it is removed from the heat source. Remove it when it is almost cooked through. Finfish will just begin to flake and the color will turn from translucent to almost opaque; shrimp and scallops will feel firm, not mushy when poked with tongs, and the flesh will have just turned opaque; lobster tails will turn a bright, rosy color and the flesh will turn from translucent to opaque. Cooking vessels for poaching are sold in stores—many will be large enough to hold a whole side of salmon. Most are made of two pieces; one holds the cooking liquid, the other is a removable insert that keeps the food from directly touching the bottom of the pan. Find a basic recipe for a poaching liquid that you like and then adjust it to suit your taste preferences. Many combinations of flavorful broth, herbs, onions, shallots, spices, wine, or juices complement the natural flavors of seafood. Bring the liquid to a simmer (it’s helpful to use a thermometer to make sure the liquid remains below 180 degrees, but above 160 degrees). Carefully place the seafood in the poaching liquid and cook gently until the texture firms and the meat just turns opaque. The seafood will continue to cook once it has been removed from the poaching liquid, so take it out just before it easily flakes or it will fall apart. Serve poached seafood warm or chilled. Baking surrounds food with even, dry heat and is an excellent method for cooking whole fish. Smaller, delicate pieces of fish do not respond as well to baking and require a coating of breadcrumbs, or a splash of broth or olive oil to keep them moist. Most varieties of shellfish tend to dry out as they cook in the oven unless a combination of cooking techniques—steaming while baking, or pan searing then baking—is used (see below for more details). To roast a whole fish, preheat the oven to about 450 degrees. Make a few vertical slashes on each side of a cleaned fish. (This will help ensure even cooking and flavors). If desired, you may soak the fish in a quick marinade; tuck a few herbs, spices, or other flavorings inside; or simply spray it with a little oil and season with salt and pepper. Place the fish on a rimmed cookie sheet or shallow pan to catch any juices that escape. As the fish roasts, baste it with the juices that accumulate in the bottom of the pan until the flesh at its thickest point just begins to flake and turns from translucent to opaque. Estimate that it will take about eight to ten minutes per inch of thickness for the fish to cook through. Rotate the pan about half way through cooking time to cook evenly. Baking is sometimes combined with other cooking techniques to more evenly and quickly cook food, or to keep baked foods from drying out. The two best examples of this are steaming while baking, or pan searing then baking. To steam while baking, simply splash your favorite combination of flavorings and a liquid (broth, juices, wine, or water) over seafood in a shallow baking pan. The amount of liquid will vary depending on the amount of seafood you are cooking, but figure that it should cover about a quarter of the seafood. Cover tightly with aluminum foil and bake in a 425 degree oven till the seafood has cooked through. Or, prepare foil “packets” by placing seafood on one half of a large piece of foil, adding desired seasonings and a splash of liquid or oil to just moisten the surface of the seafood. Fold the other side of the foil over the seafood as you would when folding a piece of paper in half. Seal the three sides by folding and crimping the edges to make a “packet.” Estimate the cooking time for the packets by using the same eight to ten minutes per inch guideline as explained above; however, add up to two minutes to the final cooking time to account for the heat having to makes its way through the foil. Pan searing then baking allows the surface of the seafood to brown and crisp, while making sure the middle of the seafood cooks through evenly. Begin by heating an oven-proof skillet on the stovetop over medium-high heat until warm. Add about a teaspoon of oil, swirl the pan to evenly coat it; and heat until almost smoking. Add the seafood, keeping multiple pieces separated. Do not touch or move the seafood until it is browned on one side. You may have to adjust the heat to so that the seafood browns evenly but does not burn. Carefully flip the seafood, and then place in a 425- 450 degree oven to finish cooking. Cook until the second side is brown, and the thickest part of the seafood is just starting to flake and is almost fully opaque. Rest two minutes and serve.